4/25/15 - We departed Georgetown (mile 403.0) with our next destination being Charleston, SC which was over 60 miles away. This would make for a very long day so we chose an anchorage from the guidebook that would work better for us and still get us close. 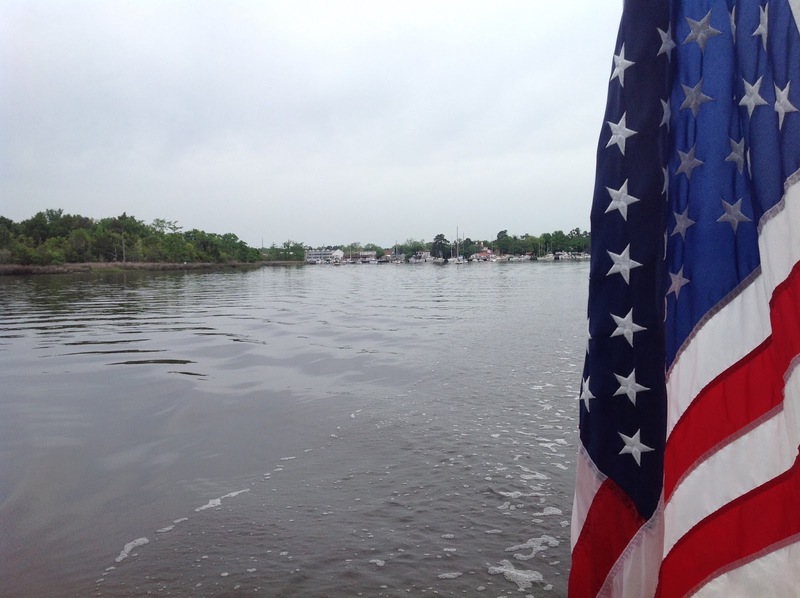 Heading south on the Waccamaw River into Winyah Bay we entered the Estherville Minim Creek Canal (4.9 miles). This empties out into a series of landcuts and canals that wind around for the next 45.5 miles through salt marshes. Driving a boat through the salt marshes is kinda like driving your car through a town with endless intersecting creeks that form a maze forcing you to pay attention to the roadmap, er, charts. There's also a strong tidal flow and it's associated shoaling through here and that requires paying close attention to the depth gauge. After 45 miles we felt exhausted and were ready for the next anchorage. We pulled off the ICW into Dewees Creek and turned into Long Creek (mile 454.3). We chose this spot because it offers some protection from the strong winds blowing that day. 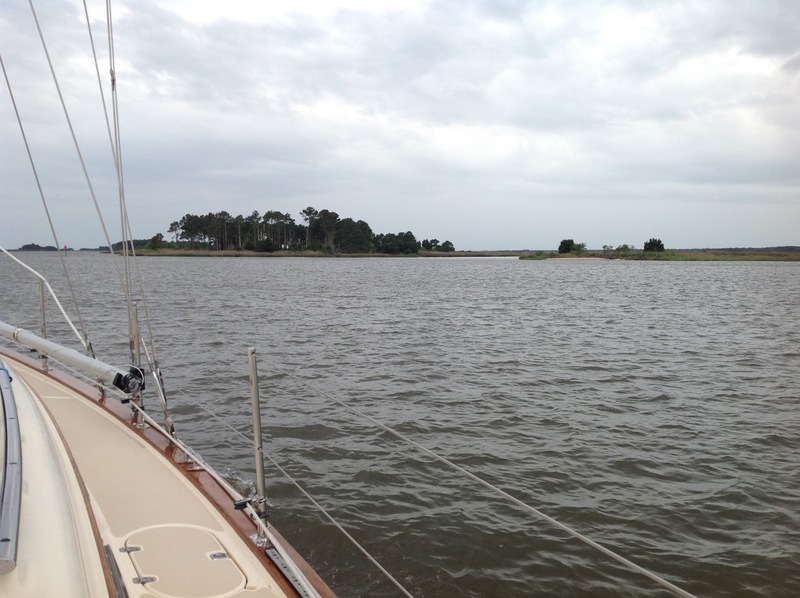 We anchored in 18' depth with the wind blowing 25 knots and a strong tidal flow in the opposite direction. Because of the depth, the 6' tide and the strong wind I let out 120' of chain. 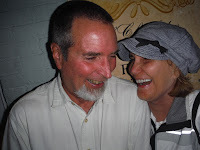 Cheri and I use simple hand signals when anchoring for communication and to minimize yelling and confusion. To ensure that we got the anchor to set properly I gave her the signal for backing down hard in reverse. When the anchor bit into the sand, mud and shell bottom it was like it had been set in concrete. We stopped so quickly the bow of the boat dipped down and I was almost thrown over. Guess we don't have to worry about dragging anchor tonight! That evening a storm blew in with rain and lightning which lasted through the next day. We decided to just sit it out for an extra day. 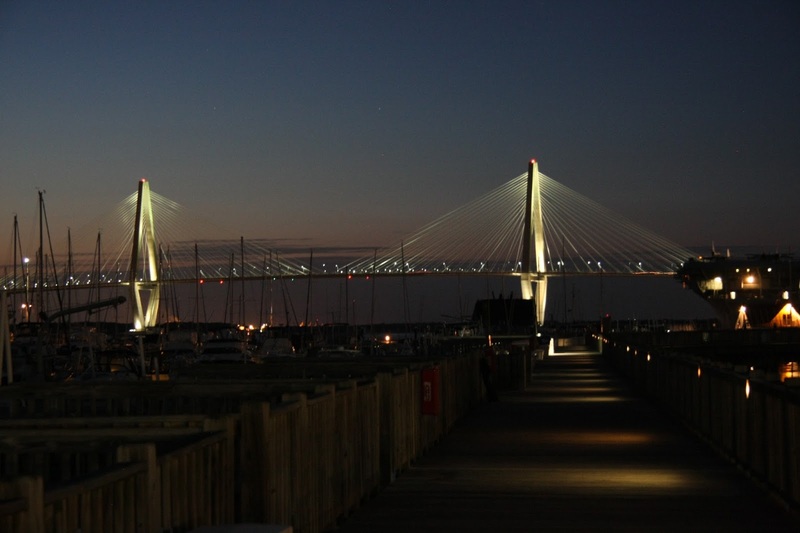 4/27/14 - Our anchorage on Long Creek was just 10 miles out of Charleston (mile 464.5) and from that distance we could see the Ravenel suspension bridge (first picture at top) and the city lights at night. 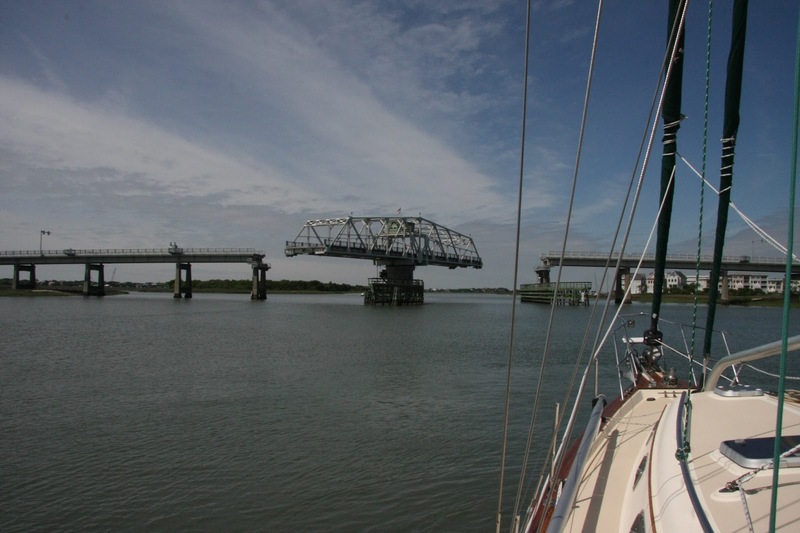 We departed Long Creek at 1030 and headed south on the ICW, passing under the Isle of Palms bridge (fixed, 65'). The approach to the second bridge, the Ben Sawyer swing bridge, had severe shoaling with depths as shallow as 5'. We touched bottom several times and there was quite a bit of VHF traffic about how best to get through. When we arrived at the swing bridge we had to wait half an hour for it's next scheduled opening. 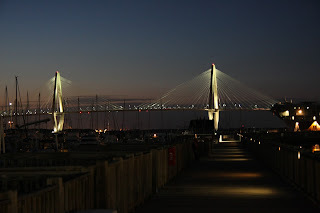 We had tried to make reservations at marinas in the city but they were all full so we ended up across the Cooper River at Charleston Harbor Marina. We found this place to be very expensive with diesel priced a dollar higher ($3.65/gallon) than anywhere else on the ICW and slip rates at $2.15/ft. The location also suffered from a strong tidal flow that made entering and departing the slip very difficult. Grrr. They did offer a water taxi service ($6.00 in each direction) but redeemed themselves with a free shuttle that only took 15 minutes to get into Market Street in Charleston. We made good use of the shuttle. 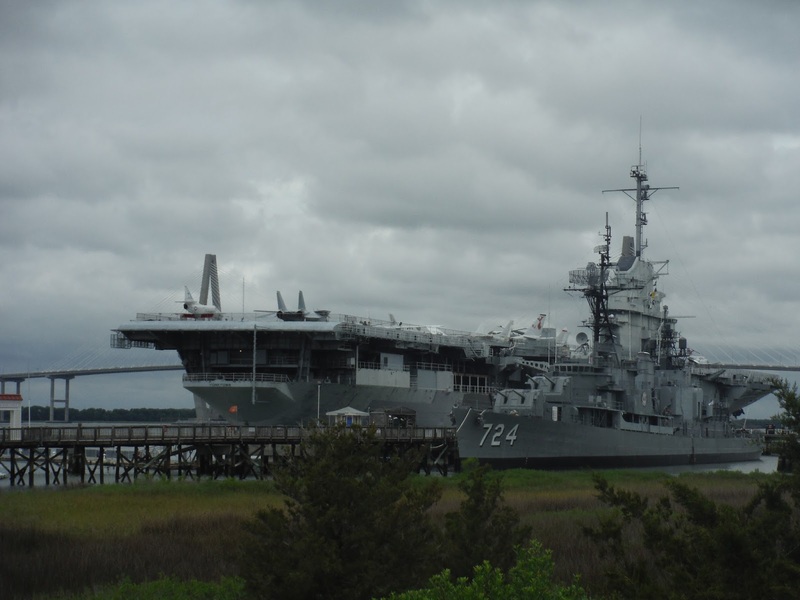 Once we got settled in at the marina we headed over to Charleston and spent the afternoon touring the city. 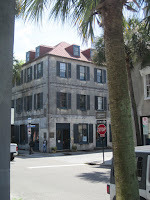 We started at the Slave Museum where we picked up a book for a self guided tour of the city. We spent the rest of the day wandering the streets of the old part of town, learning the history and enjoying the beauty. Had lunch at the Brown Dog Cafe. On 4/28 we returned for another day of wandering. 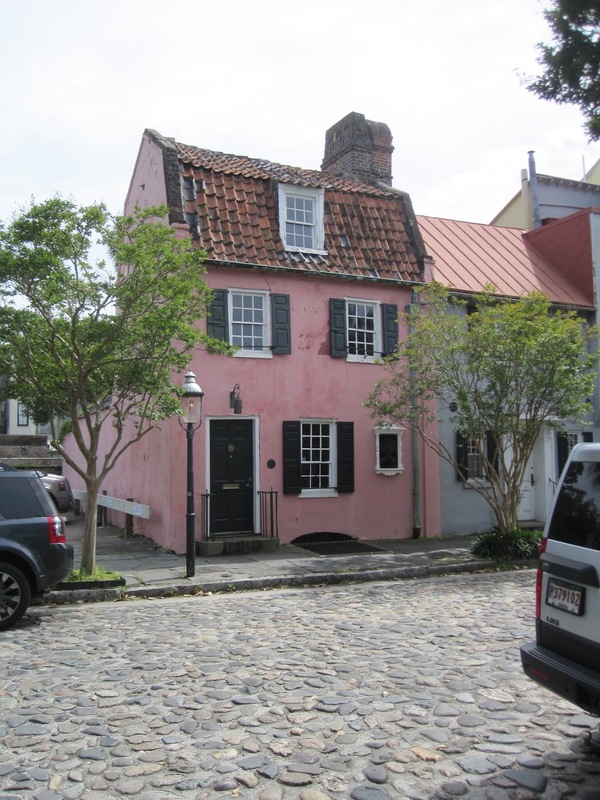 Charleston is known for fine dining and has a long list of excellent restaurants. 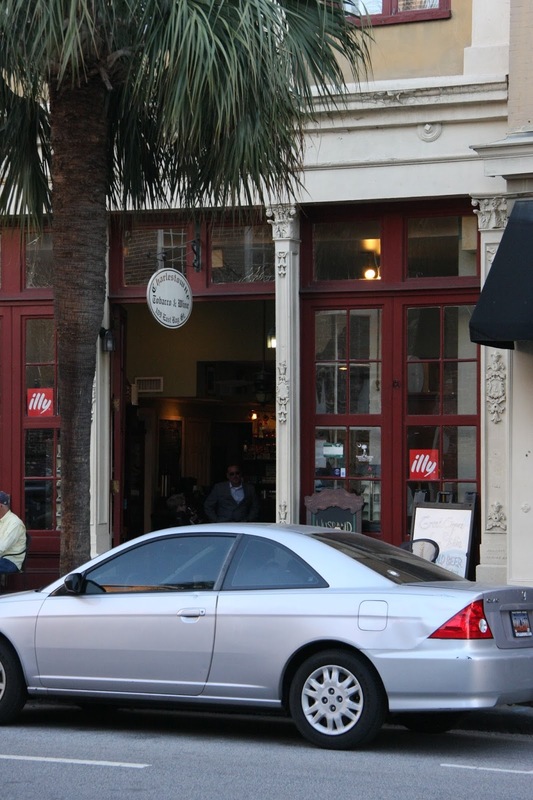 We stumbled on 82 Queen for lunch and enjoyed our meal while seated outside in the courtyard. We had no real plans for this day, mostly intentions to shop. We didn't get far though before we discovered a nice little cigar shop that also offered beer and wine. We commandeered a table just inside the entrance and stayed there for five hours. We spent the rest of the day making new friends with the shop owner and several of the locals. One in particular was an older gal who turned out to be a professional walking-tour guide in the city. She loved to talk and if you had listened in on the conversation you would have thought we had all known each other for years. Another character we met was an author who was working on a book about serial murderers in the US. This was the highlight of our visit to Charleston. 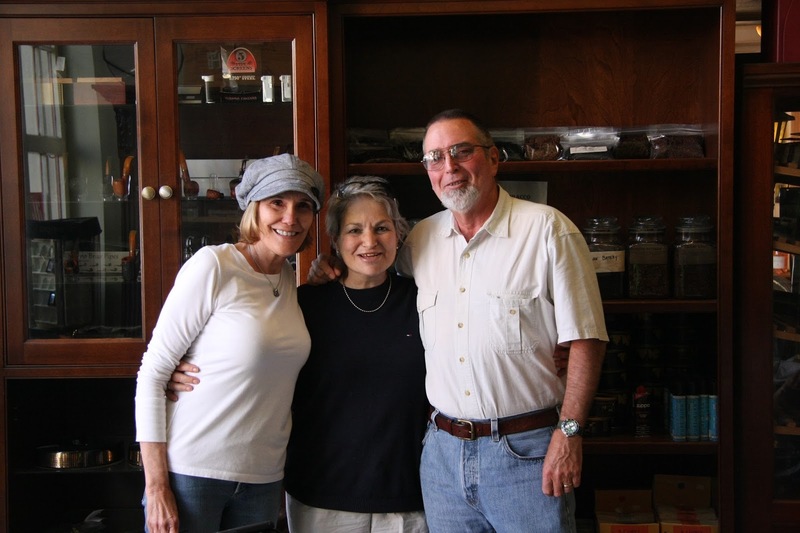 Fine wine, great cigars and friendly and interesting people. Who could ask for more? Our last day there was a rainy one so we spent it at the marina doing laundry and cleaning up the living quarters on the boat. 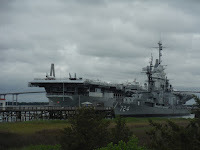 Next to the marina was a Naval Museum with an aircraft carrier (USS Yorktown) and destroyer (USS Laffey). We wandered over and took a look but didn't want to invest in the $40 (for two) entry fee. This is a beautiful city with history going back to it's 1670 origins. In 1718 the city was besieged by Blackbeard the pirate and in it's early years was under constant attack by the French, Spanish and Native Americans. During the Revolutionary War the city was attacked by the British fleet several times. The first time they were repelled by a hastily built fort made of Palmetto logs. The "liberty" flag flown in this battle became the state flag for South Carolina with the addition of a Palmetto tree emblem commemorating this battle. The second attack in 1780 was more successful and the British held the city for two years. This was considered the greatest American defeat of the war. Charleston played a leading role in the slave trade with something like 40% of all slaves in America brought over from Africa. When international slave trade was outlawed in 1808 Charleston became the center of an even larger domestic slave market with slaves being brought there for sale from all over the south. The slave museum we visited had been a huge indoor slave market in the mid-1800's. We learned that our home state of Maryland was a major contributor. 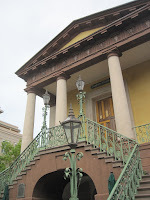 During this time Charleston also became a big exporter of Indigo, a blue dye that was in short supply in Europe. It's also what's used to make bluejeans blue. In 1862 the attack on Fort Sumter in Charleston's harbor began the Civil War. During the war a blockade was established that effectively ended commercial traffic in the city. It was at this time that one of the first submarines, the H.L. Hunley, was used in naval warfare, attacking one of the ships in the blockade. In 1861 Charleston was ravaged by fire, unrelated to the war, which burned over 500 acres of the city. In 1886 the city was nearly destroyed by one of the strongest earthquakes to hit the East Coast, registering 7.3 on the Richter scale, second only to the New Madrid earthquakes of 1811 and 1812. The city's economy languished for decades but has recovered to become well known world-wide for it's art, music, local cuisine and fashion. 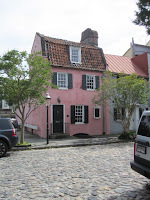 We found Charleston to be a beautiful city with an interesting history and plenty of interesting people. This was easily the best part of our trip down the ICW.